If there is one thing the events over the past two months have proven beyond a reasonable doubt, it is that when it comes to risk prices, only one thing matters - not fundamentals, not political risks, not earnings forecasts, not squiggly lines on charts, not opinions about the economy or even inflation and interest rate forecasts; Nope - the only thing that truly matters is how much liquidity is being generated or drained by the Fed at any given moment, i.e. is Powell hawkish or dovish. ... the S&P has continued to surge, up on 18 out of 24 trading days so far in 2019 with YTD gains of +9.20%, with Deutsche Bank calculating that only 5 other years in history have matched or beat this in terms of least number of negative days to this point in the year. 1954, 1961, 1965 and 1971 saw the same number, while only 1967 saw less negative days (5) through February 5th. Said otherwise, the S&P is now up +16.43% since its Christmas Eve trough, advancing on 21 of 28 days since then. That’s the best such streak since November 2017. What is behind this remarkable rally that has ignored both what is at best a mediocre earnings season, a drop in Q1 EPS forecasts amid broad profit warnings, and dismal economic news? 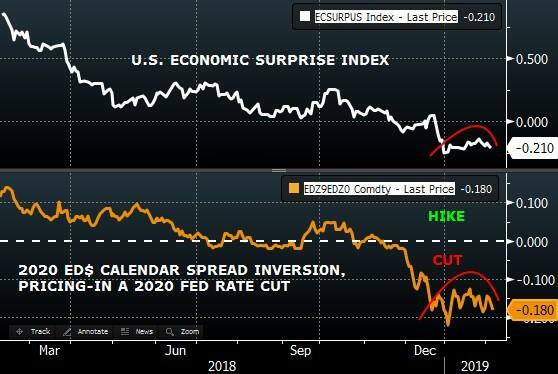 According to Nomura's Charlie McElligott the answer is simple: Fed "rate cut" bets are accelerating again, with Eurodollar curves flattening powerfully overnight after the past few days of US data "misses." 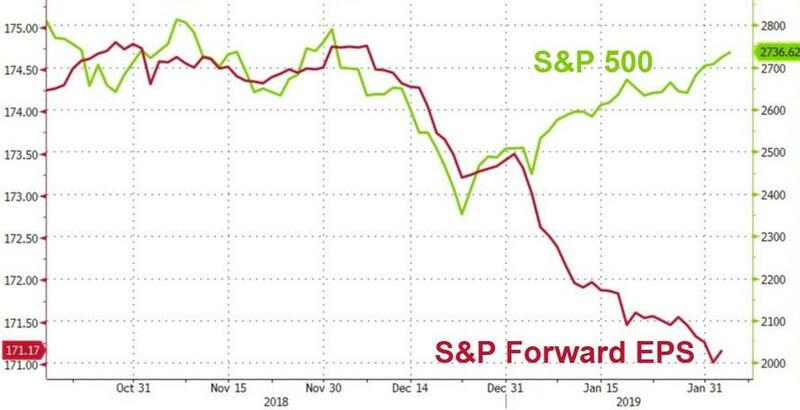 As the Nomura strategist explains in his morning note, "the profile move overnight is the reacceleration of ED$ curve flattening as “Fed rate cut” bets grow, again nearing the lows witnessed at the very start of 2019 following recent misses in US Data—with AHE, U-Rate, change of Manufacturing Payrolls, Durable Goods, Factory Orders and ISM Non-Manu all disappointing over the past four sessions." And while stocks continue to levitate on hopes of a tide of liquidity washing up as soon as 2020 once the Fed starting cutting rates again (perhaps going all the way to negative if the San Fran Fed has its way), another key liquidity-based driver is coming out of China, where recent desperate credit/liquidity injection measures are finally starting to kick in. 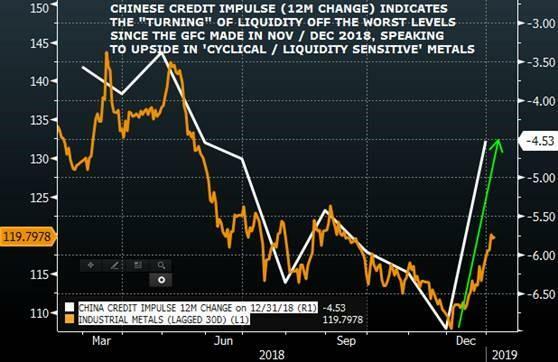 As a result, after printing post-crisis lows in late 2018, the all-important Chinese "Credit Impulse" is now pivoting higher as the lagging impact of easing/stimulus/liquidity injections begins to show in the "rate of change" trajectory now pointing upwards. In turn, Nomura is seeing highly "liquidity-sensitive" Industrial Metals too turn higher, which has shown to be a precursor to a short-term boost in Inflation Expectations and Cyclical/Value Equities. 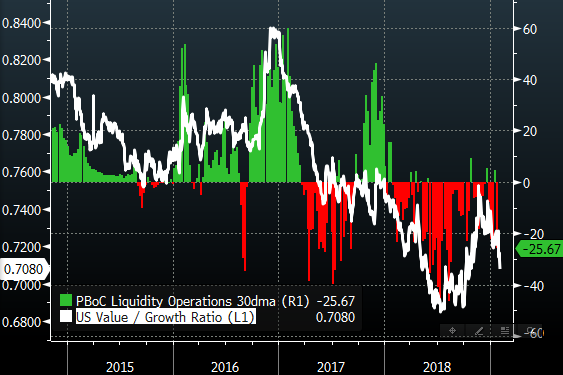 And just to demonstrate how critical to US stocks is "China-sponsored" liquidity to global market, look no further than the below stunning chart of PBoC open market operations (on a cumulative 30 day moving average basis) relative to the key Value/Growth ratio for US stocks. If there was ever any doubt that the relative performance of US stocks - and especially FAANGs/growth names - is a function of Chinese liquidity, it can quietly be put to rest. So with China having "launched" upward stock momentum courtesy of its rebounding credit impulse, it is now the CTAs turn to accelerate this move to the upside, and that's precisely what they are doing because as McElligott writes, confirming his recent observations, the bank's Systematic Trend model continues to see more capitulatory Global Equities futures "force-in," as legacy "Shorts" cover and pivot-back to “Max Long”—with Nikkei, FTSE and CAC joining already “Max Long” U.S. Equities futures in SPX, NDX and Russell 2000.